If the answer is YES - we have the solution that can help you keep the offices under control. Whether the sites are in different cities or countries, we have the solution that will exceed your expectations. Whether you want the content controlled by Head Office or just to ensure every site is protected - A2Z Computing have the solution. The UTM will connect your multiple sites together, you will be able to pass information as if you were next door to one another. It doesn't matter if your sites are in Australia, France, Cardiff and Brazil - all the sites will be able to communicate together. All documentation can be stored centrally at Head Office, so when a change occurs every site immediately has the updated document. Next-Generation Firewalls will protect against the web-based threats. Web Filtering can be applied. E.g. I do not want Twitter to be accessed via these PCs at all. However, I would like Facebook to be allowed for 1hour only between 12pm - 2pm. Multiple policies can be applied, revoked and recorded. E-mail Filtering will ensure that spam and viruses do not reach your inbox. They are thoroughly scanned before reaching the inbox. Endpoint Protection will monitor all sites ensuring no viruses or threats are on the system. If any threats show on the system, it will be alerted to the Head Office so the threat can be dealt with immediately. As your business grows the UTM will grow with you. A site can easily be added or removed without any fuss. The UTM provides flexability whilst providing overall protection for your infrastructure. 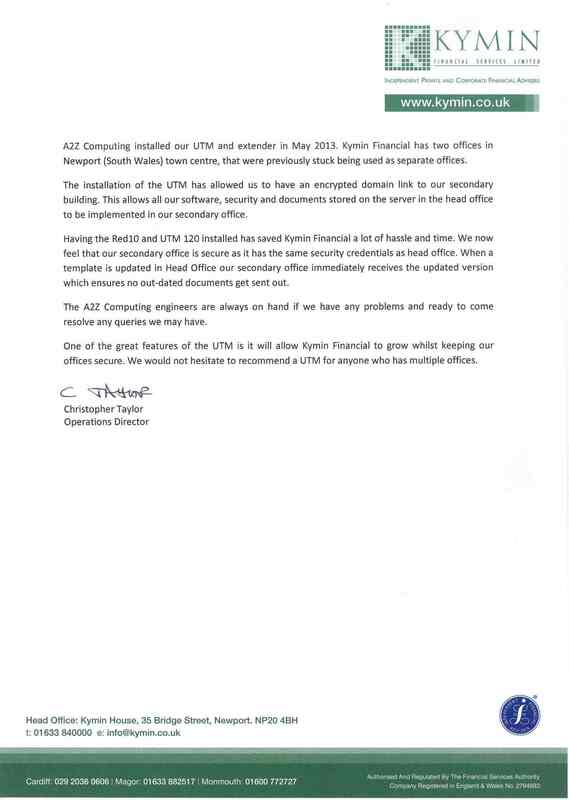 For more information please contact an A2Z Computing representative or download our product overview sheet.